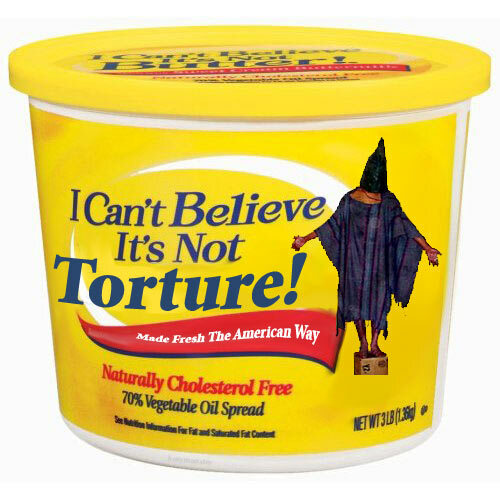 I can't believe it's not torture! Early on I suggested the Republican presidential primary should be titled "Who wants to be a waterboarder?" because of the way the leading candidates (save John McCain) were competing to be the torturer in chief. But I think Rudy Giuliani wins the torture primary with his idiotic remarks about waterboarding, taken apart most ably by Salon's Joe Conason today. I also love this video by our friends at Current TV. Given that there's not a lot of archival footage of waterboarding -- it wasn't done at Abu Ghraib -- Current videographers Kaj and Mitch Koss produced this waterboarding simulation. Sounds like a wild idea? It's hard to watch. Seems you can neither fake nor elude the horror of waterboarding, even "just" on video. Giuliani's waterboarding idiocy was bad enough, but his comments about the use of sleep deprivation in interrogation were arguably worse. "They talk about sleep deprivation," he said. "I mean, on that theory, I'm getting tortured running for president of the United States. That's plain silly. That's silly." Ah, Rudy. Your mouth will eventually be your undoing. And it can't happen soon enough. To his credit, McCain blasted Giuliani on Thursday for his waterboarding ignorance: "All I can say is that it was used in the Spanish Inquisition, it was used in Pol Pot's genocide in Cambodia, and there are reports that it is being used against Buddhist monks today," McCain told the New York Times. The Times added: "Of presidential candidates like Mr. Giuliani, who say that they are unsure whether waterboarding is torture, Mr. McCain said: 'They should know what it is. It is not a complicated procedure. It is torture.'" I've criticized McCain repeatedly on the war, about which he is deeply wrong, but I am grateful for his moral clarity today. I've always loved this Mark Malamud graphic, found via Boing Boing's Xeni Jardin. It's dark-humor Friday here at Salon. Torture jokes on the campaign trail. I can't believe Giuliani's the GOP front-runner!